Flaxseed is a rich store of the omega-3 fatty acid alpha-linolenic acid and lignan--a powerful antioxidant. Flax oil does not contain the beneficial lignans and eating the seeds, ground or whole, will give you benefits. Health experts often recommend adding some ground flaxseed to smoothies, cereals, soups, salads and other foods. Making this food a regular part of your diet might reap several benefits though some purported uses require more research to substantiate health claims. Omega-3 fatty acids have been well-documented for their anti-inflammatory properties. Flax seed serves as one of the richest nonanimal sources, perfect if you cannot or do not want to consume fatty fish. Regularly consuming flaxseed might benefit arthritis and other conditions influenced by inflammation. The University of Maryland Medical Center, however, notes that this sort of fatty acid might not work as well as the type found in fish oil. The body can convert ALA to the fatty acids found in fish but it probably does not reap the same benefits as directly eating foods that contain them. Research indicates that the antioxidant properties of lignan might offer protection against some cancers, according to the UMMC. MayoClinic.com explains that lignan has estrogen-like properties and might bind to estrogen receptors in breast cells; this would prevent estrogen in the body from attaching and fueling tumor growth. This connection requires further study in human subjects. Flaxseed represents a rich source of fiber and research indicates it might have a laxative effect. Taking too much flaxseed or any fiber-rich food or supplement without sufficient water intake can lead to constipation and possible bowel obstruction. Healthcastle.com, a website written by registered dietitians notes research that indicates flaxseed might help irritable bowel syndrome by reducing intestinal inflammation. Omega-3 fatty acids have been touted as powerful tools for improving overall heart health and flaxseed might help lower cholesterol but the UMMC notes that studies have produced mixed results. It also notes evidence that shows people who eat a diet rich in ALA have a decreased risk of dying from a heart attack. 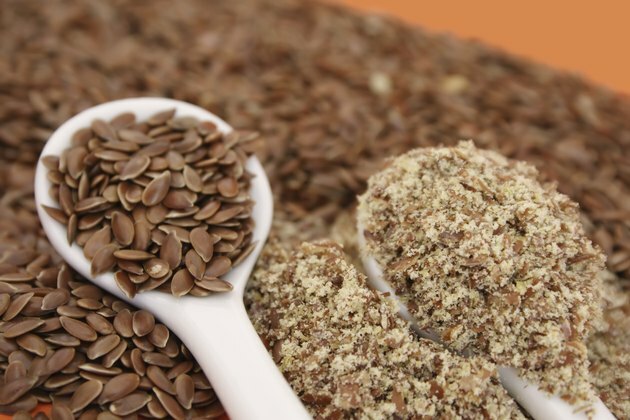 Flaxseed appears to work in several ways to promote heart health including reducing blood clotting, inflammation and improving blood vessel health.